The total number of 34 suspects including 6 women and 28 men were arrested in Diaso community in Ghana over the lynching and killing of a Ghanaian army detachment captain, Maxwell Mahama who was mistaken as an armed robber by the people of the community when the army on his morning jogging exercise stop to ask a woman for a route, then, the woman called other community members mostly the youths and Maxwell Mahama who was without uniform was lynched and lastly killed. 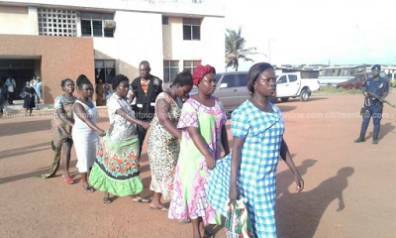 The remanded 6 women which includes 2 nursing mothers were charged with conspiracy to commit murder at Accra Central District Court 3. George Ameke, the state prosecutor presented the main fact of the felonious case and pleaded the court to remand the 34 suspects of Captain Maxwell Mahama lynching and murder, untill the June 21, 2017. The prosecutor said the adjournment will enable the law agencies to continue their thorough investigations to reveal all the suspects in the lynching and murder. Last week, 7 suspects were arrested including an Assemblyman who raised the ovation to the community youths just to lynch and deal with Captain Maxwell Mahama but the lynching unfortunately resulted to murdering.